Today we share an excellent article by Egyptian writer Amal Hejazi. Amal is passionate about Egyptians exploring their own country instead of taking their holidays overseas, but her article also speaks to those outside Egypt, suggesting you explore more than just the usual tourist destinations in this amazing country. Amal has some great suggestions on where to start seeing Egypt in a new light…. Do you want to explore a new way of fun? You have a vacation and you don’t know where to go! You are bored of the same old places you have been visiting over and over again? It’s time to discover new spots; where you can enjoy the beauty of nature and the amazing scenery of the azure sea rushing to the shore to hug the beautiful white sands of the beach. If you are ready, follow me, we are heading to Sahl Hasheesh, Castle Zaman, Basata, Ras Shitan and then to the White Desert. I bet many of you didn’t hear of these places before and didn’t know that they are here in Egypt, right? So you definitely need the following guide. It is the new destination for entertainment and leisure. 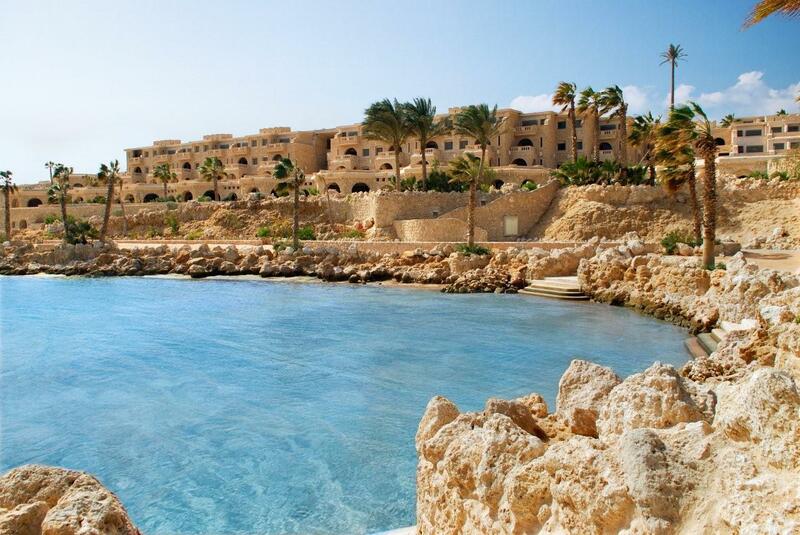 It is located on the Red Sea, just 18 kilometer south of Hurghada International Airport. In the 12 km long bay with its wonderful sandy beaches emerges with the Premium Resort Sahl Hasheesh a new “hot spot” of the absolute superlative. The infrastructure in the Resort has already been entirely completed, the opening of the first few hotels and luxury apartments took place in the first half of 2007. Fairy-tale hotels, luxurious apartments, a new “Old Town” with the flair of 1001 nights, unforgettable diving areas, golf courts, a cinema complex as well as a worldwide unique marina – the Premium Resort Sahl Hasheesh – soon will be one of the most exclusive addresses on the Red Sea. Short flight times from all European capitals, a warm climate throughout the year and the ongoing effective development of the touristic potential provide for a constant, dynamic progression of the real estate prices in Egypt, especially at the Red Sea. The countdown to the grand opening of Old Town at Sahl Hasheesh expected in the second quarter of 2011 has officially begun. At the heart of the resort, the beautiful waterfront will offer a full array of boutique shops, restaurants, cafes, a dive center, and entertainment and nightlife venues. The imminent opening of Old Town marks a significant step in the evolution of Sahl Hasheesh; whereas currently vacationers and residents might feel the need to drive to Hurghada for fine dining, shopping, and an evening’s entertainment, Old Town will soon offer all these activities within convenient walking distance of their hotel or front door. On the Gulf of Aqaba, and only 40 km away from Taba Castle Zaman is built by Hani Roshdi, a young architect. Hani had a vision; to construct a castle, far away from busy Cairo. He puts the final touches to the castle in 2003. The castle was built using only materials available locally, including stone actually quarried on the Sinai Peninsula. Only traditional building methods were used, and incredibly, no concrete or metal were deployed at all. Great efforts were made so that the castle would be eco friendly, with reclaimed wood used for both building work and furniture. Not only that, but all glass in the building is made from recycled glass bottles, and local crafts decorate the castle. 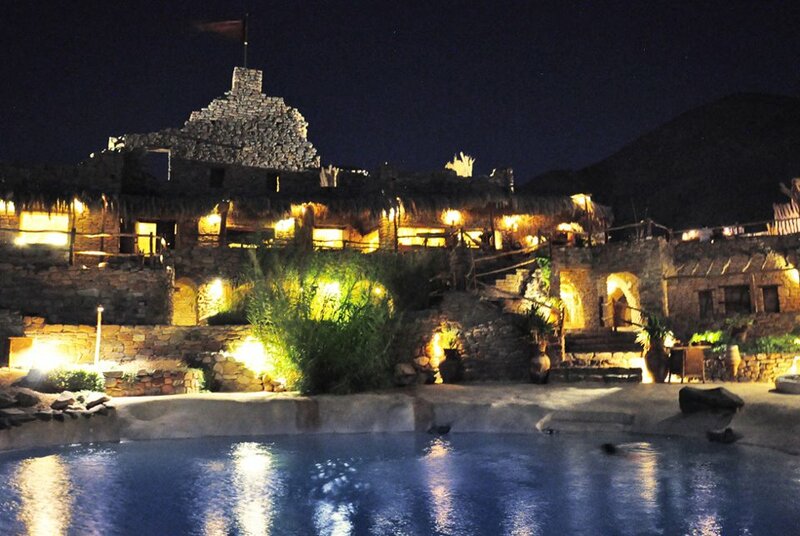 Castle Zaman is open for visitors, and has an amazing pool overlooking the Red Sea. It’s a relaxing, laid back place to be, with bean bags to sit on, and music playing that is eclectic, but not intrusive. The Castle also has a beautiful, private beach, and it is possible to swim out from the beach to see the coral under the clear water. Castle Zaman specialty is serving the opposite of fast food. If meat is ordered it takes three hours to cook on a low heat, so order very early if you are hungry! This method of cooking gives it an incredible flavor. There is a great choice of dishes on the menu. This castle even has a dungeon; there are no prisoners however, because this space is devoted to local crafts, which can be purchased as authentic souvenirs of the region. Castle Zaman (means ‘Castle from the Past’ in Arabic). So, If you go to Egypt and think you see a medieval castle, your eyes won’t be deceiving you. The name itself (means Simplicity in Arabic), that will help you know what this magnificent place look like. Basata offers a new experience that everyone should live. So, if you want to escape from the pressures of modern living, come along. TV’s, blaring radios, and air-conditioning are not a part of the Basata way of life. However, snorkeling at sunrise, safari, and admiring the moonrise or star gazing are. Basata was the first tourist project Sinai, established in 1986. It was designed and constructed by Sherif El-Ghamrawy, an Egyptian construction engineer. Basata operates on a system of honour and trust, something mostly forgotten in the hustle and bustle of modern day life. Upon arrival guests are given a piece of paper upon which they record the items that they take from the kitchen. At the end of their stay, the bill is calculated accordingly. Guests are also requested to adhere to the recycling system practiced here. Bins are marked separating refuse into categories, glass, plastic, food waste and metal. These materials are then sent to a recycling plant or fed to the animals. This open system puts responsibility back into the hands of the guests and makes them feel at home, thus increasing awareness of the effects of their actions on nature and on other people while leaving the area unspoiled for future generations. Construction of buildings and huts in Basata is conducted in harmony with the Sinai landscape. Each is uniquely designed and constructed using only natural materials endemic to the region by Egyptian architects and workers using traditional methods and reflecting traditional Egyptian architecture. The effects are long lasting and will teach all who experience it to work together with nature and not against. Basata is the Only place where Simplicity of living happily meets the magic of nature. A beautiful place about 16 kilometers north of Nuweiba on the Red Sea. There are lots of Bedouin places where you can chill out. The place itself is amazingly beautiful. You can really feel how close you are to nature while sleeping on the beach in the morning and feeling the cool breeze at night. The sheltered camp of Ras Shitan is named after a rock formation on the tip of the bay, which the Bedouins believe resembles the head of the Devil. The camp is sheltered by these outcrops of rocks, to offer a calm and quiet area. At night, this camp comes to life with a beautiful atmosphere; camp fires, candle lights guitars and singing. This camp is also situated on a stunning dive and snorkel site. The place retains its simplicity and harmony with powerful desert and crystal sea reef. 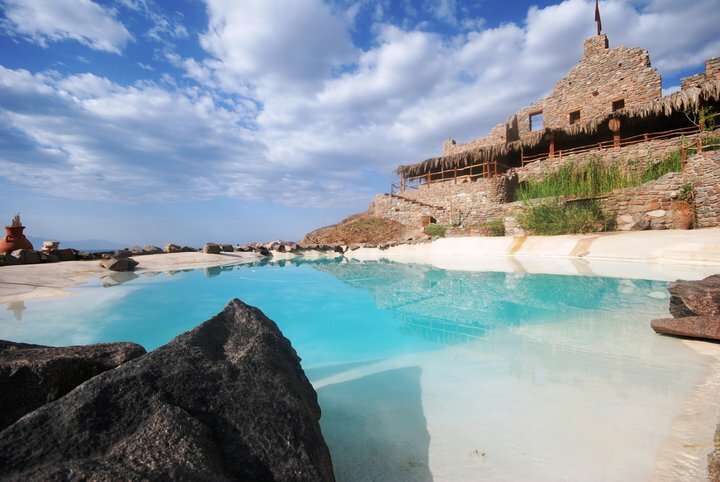 Ras Sinai is the ideal place for a vacation of relaxation, tranquility and inspiration. A meeting place where a large family of friends and musicians keep coming back to gather around the fire and share cultures by music and stories. The activities there are endless; beginning with enjoying the unique Sinai beach, swimming and snorkeling, collecting shells, or hiking the mountains surrounding the place. You can have a personal Yoga session by the water line, guided by an experienced teacher. Personal guided scuba diving is also possible. Well, I think life has a different meaning there! It’s a place where wind and water erosions sculptured their way through the soft chalk forming incredible shapes. In its area, sprout several springs that supplied much of the needed water to the caravans. 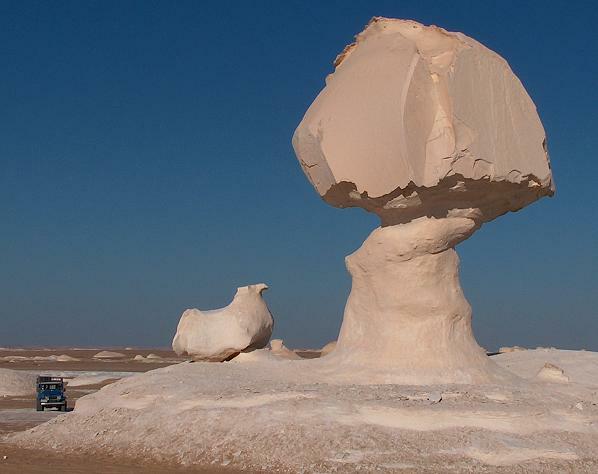 Therefore the White desert is considered a unique geographical phenomenon. Walking through the White Desert is a real monumental experience. It is located in the Libya Desert approximately mid-way between Dakhla and Bahariya. A main geographic attraction of Farafra is its White Desert (known as Sahara el Beyda, with the word Sahara meaning a desert). 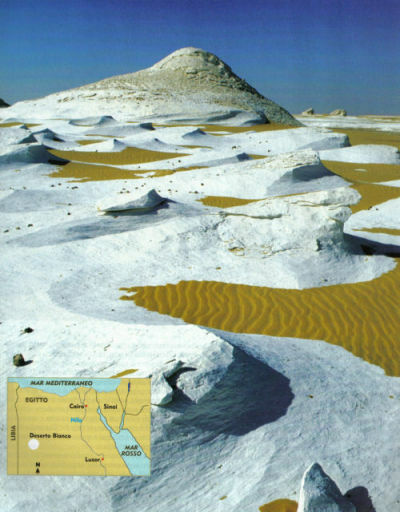 The White Desert of Egypt is located 45 km (30 miles) north of Farafra. The desert has a white, cream color and has massive chalk rock formations that have been created as a result of occasional sandstorms in the area. The Farafra desert is a typical place visited by some schools in Egypt, as a location for camping trips. The White Desert in Egypt is one of the most beautiful places in the world. Shining white limestone covers the surface and makes amazing rock formations in the sand, giving this place its name. You can call it Paradise in Egypt. So, what are you waiting for? The choice is all yours just define your destination and let the fun begin. This entry was posted in NUWEIBA, RED SEA, SINAI. Bookmark the permalink.